The ExoWear sensor measures joint mobility and tracks frequency of movement. ExoWear wants to improve knee surgery outcomes by enlisting physical therapists to prescribe it to their patients. We conducted UX research and design for the physician interface. First order of business: find out what physical therapists need from this interface. We chose five areas to explore with the aim of uncovering how ExoWear could add value for physical therapists. What is the competitive landscape and industry outlook? What is the recovery process for knee replacement surgery? How are home exercise programs assigned and monitored? What motivates patients to adhere to these programs? What information do physical therapists track and what do they use it for? Our domain research gave us a picture of a growing industry. But what's in a knee? By age 80, a full 10% of Americans will have undergone total knee replacement. Prognosis is good, but recovery is painful and requires outpatient physical therapy for up to 12 weeks. During that time, home exercise program adherence is the biggest factor affecting patient outcomes. Up to 65% of patients don't adhere to their home exercise program. To complicate matters, the annual, per person Medicare cap is $1,940. With many knee replacement patients having other physical therapy needs, this makes it even more important for physical therapists to maximize patient recovery in as few visits as possible. Improving those exercise program adherence rates goes a long way to achieving a fuller recovery faster. We were curious to find out what other wearable and digital product companies are doing to address this issue. To understand ExoWear's competition, we looked at all of the ways physical therapists help patients achieve better results through their home exercise programs. We interviewed five physical therapists and one doctor. We also conducted a contextual inquiry at a physical therapy clinic. What we observed caused us to expand our research to include patients and supportive family members. If therapists feel they do all they can to get patients to adhere to their exercise plans, what more can be done? And by whom? We interviewed patients who've had a knee replacement surgery and the people who supported them during recovery. We were particularly interested in factors affecting motivation. People we interviewed talked about similar drags on their motivation: a sense of confusion and a sense of pointlessness. The patient’s suffering led them to knee surgery, which is itself a painful intervention. They're highly motivated to recover. They're also worried about the pain and frustrated by limitations that make them more dependent on others. Their main goal is getting full knee function back so they can go back to their normal, independent lifestyle. Family members encouraged the patient to seek help and are very invested in the patient’s recovery. They may drive them to appointments, help them around the house, or call the patient every few days to see how they’re doing. They know that the patient is very independent and want to show their support without being overbearing. Their goal is to help the patient recover quickly. These doctors evaluate patients for possible total knee replacement. They prescribe post-surgery physical therapy to all patients. Many have certain therapists they trust and refer to often. For those therapists the prescription is often “Eval and Treat.” The surgeon expects the therapist to keep them up-to-date during the treatment period. Usually this involves phone calls and faxes. Therapists love working with patients directly and loathe dealing with electronic records and paperwork. They track every minute of an appointment closely. All therapists assign patients a home exercise program. They see themselves as partners in patient recovery and put a lot of effort into building rapport. Next we mapped out how these archetypes relate along the patient's journey to recovery after knee replacement. We wanted to identify where ExoWear could drive improved patient outcomes. 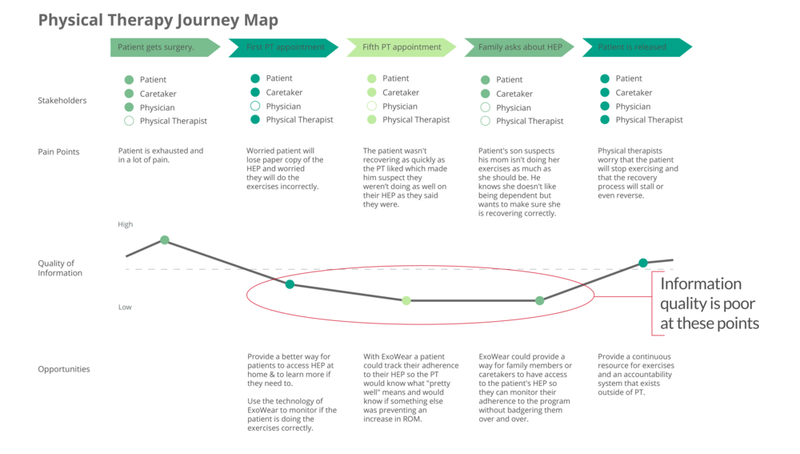 This journey map revealed opportunities for ExoWear to improve information quality at key points in the therapeutic process. It became very clear from the journey map that patients bear a lot of responsibility for their recovery. Home exercise programs are key to that recovery, but there's no good way for patients to see their progress. And physical therapists must rely on anecdotal responses to questions like, "How are you doing with your exercises?" Information is understandable in 5 seconds or less. Minimizes learning curve. Meets users where they are no matter their age, technology expertise, device, or eyesight. Simplifies the micro-routines involved in patient care. Extends the supportive influence of the therapist beyond the clinic. Leverages data available to the application for maximum value. We decided that the therapist should be able to assign and modify the home exercise program via a web app. This way we could improve on their current micro routine without adding additional tasks. For reporting results back to the physical therapist, we decided the patient should be the one to present the data. This keeps the focus on patient accountability. It also offers an opportunity to build the relationship between patient and therapist, something all physical therapists we interviewed valued. To validate our concept we decided to create Balsamiq mockups and present them to testers via a clickable prototype. We tested two dashboard approaches: one more visual and one more narrative. Our next iteration needs two dashboards: one for patients and one specifically for patients to show physical therapists. It was clear from our concept testing that the heart of the ExoWear value proposition is quality data. Our job was to render the data in a meaningful way for both patients and physical therapists. We did several rounds of quick sketches followed by more in-depth drawings. I experimented with visualizing the range of motion data points and positioning data relative to goals. Users gave us great feedback on the prototype as well as several insights we used to strengthen the data visualization and exercise sequences. Below are the two mobile dashboards after we made changes from the usability testing feedback. The screen on the left shows the report that patient will show to physical therapist. The screen on the right is the patient's dashboard. The exercise sequence is a cornerstone of the mobile app. If patients use it, the app provides great data. If they don't, there's no data to report. The final exercise session sequence tested strongly with patients. We're confident it provides primary value that will motivate patients to interact with it. The final prototype of the web app tested very well, too. Physical therapists completed initial setup of a home exercise plan within 3 minutes. All testers said this was an improvement over their current method. Particularly because the data becomes immediately available to patients via the mobile app. Does this technology really exist? That would have been really helpful. Hearing from patients and physical therapists during our final testing gave us, and our client, a lot of enthusiasm for the solution we developed. The next steps for the client are to build the interfaces and use them to beta test the ExoWear sensor in a clinical setting. I learned from this project that there are numerous ways to reach a goal. The best way is the one that makes sense to the user. By that I mean that it reflects the users values and recognizes their real-world constraints. Initially the time constraints facing physical therapists felt like a challenge for us as designers. However, once we interviewed patients and family members we saw opportunity. Our final solution saves therapists time and increases their insight into patients' home exercise adherence and progress. We set out to simply craft an interface for physical therapists. Through persistent focus on the user we ended up designing a therapeutic tool that will benefit all parties.